Accepting your Direct Transfer tickets is easy. Follow this step-by-step guide and you will be ready for your event in no time! Step 1- You (the lead person attending the game) will receive an email from a verified source eg Ticket Master or the franchise or stadium that is hosting the event. When your tickets have been transferred by the seller (see Ticket Release Date), you will receive an email with a link to accept your tickets. You may also receive an additional email with further instructions and troubleshooting tips from USSPORTSTICKETS.COM depending on where your tickets were transferred from. Once you have clicked on 'Accept Tickets' you are required to sign into your exiting account or if you don't have an existing account you will need to create a new account. Please note that some franchises, such as the Yankees have their own accounts. Below are some examples of the standard Ticketmaster account and the Yankees. Once you have set up your account, click on your ticket to claim, you must claim before the expiry date mentioned in the account. Mobile tickets are always available—HOWEVER, the QR Code may only appear 24-48 hours before your event. This will vary based on venue, team, performer. (See Expected Ticket Delivery Date for details). You must use your MOBILE DEVICE to see your QR code. You will not be able to see them when using a computer. Do not print these tickets. You must use a mobile device to enter as paper tickets will not be admitted into the event. Once your QR Tickets have populated you can click on the code and save them to your Mobile Wallet or upload them to our device. A mobile ticket contains a unique ticket verification QR code. It also contains the customary ticket information that you are familiar with seeing on a traditional hard stock paper ticket such as game date, time, section, row, seat, etc. For security purposes, the ticket verification QR code on mobile tickets does not appear until 48 hours before the scheduled start time of a game. Why is the ticket verification QR code not visible on my mobile ticket? For security purposes, the ticket verification QR Code on mobile tickets does not appear until about 48 hours before the scheduled start time of a game unless advised earlier (See Expected Ticket Delivery Date for details). Can I transfer my mobile ticket to a family member or friend? Yes. 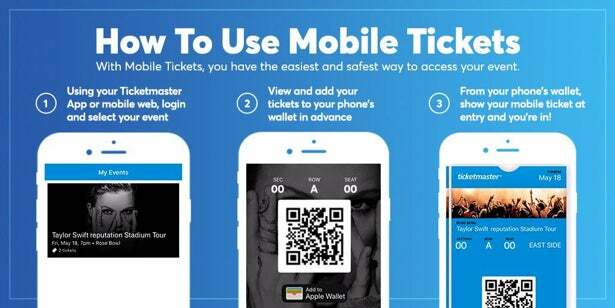 Fans can freely transfer their mobile ticket to a family member or a friend's Smartphone. Any Smartphone that can browse the Internet can load a mobile ticket.